03.Feb.02 - Activists from 'ninguna persona es ilegal' have set up a protest camp in front of the Immigrant detention Center in the town of Malaga. They have blocked the entrance of the center since Thursday the 26th of January in support of 8 immigrants who have had been arrested during a demonstration in Almeria where they where demanding the legalization of their residence status. The 8 arrested immigrants had been transferred to the CIE in Malaga where the authorities wanted to detain them until their deportation to their countries of origin. In support of immigrants struggles and celebrating a year of active disobedience to the Spanish foreigners law the activists decided to stay in front of the center and to control every vehicle that could possibly transfer immigrants from or to the center. On the morning of the 29th of January the blockade was ended by police forces. At the same time a group of 23 immigrants was deported from the detention Center. A group of 10 people tried to prevent the leaving of the police vans by lying on the road, but they were also evicted and ordered to leave the place. At 11.30 a.m. a demonstration took place. There were different actions [a boy hung in a tree with a banner saying 'deported', and a group of 25 people staying on the road interrupting the traffic flow] In the meantime 2 persons had chained themselves to the door of the detention center and minutes later the rest of the group joined them running to this door and formed a human chain. The group was the again removed by the police, without any injuries or arrests. On the way home were evicted without a wounded and we were going pacifically at home the police did however violently arrest 2 activists. They were brought inside the detention center where they were beaten up by a group of police officers. They were detained inside the center for 24 hours before they were released. 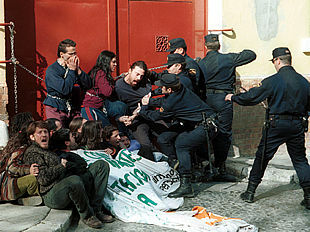 The deportation of the group of Almeria immigrants took place at the same moment when the two activists were released from the justice palace. One of the two arrested activists has also been issued a deportation order as he has an Italian passport. He was ordered to leave Spain within 8 days, although he has been a longtime resident. The complete rejection to the Foreigner Law, and as a consequence the refusal and denunciation of deportations and specially the deportation of 8 migrants that where brutally repressed the past 22snd January in Almeria (south of Spain) and who where imprisoned in Malaga's Internment Center. Support and active solidarity to the rest of migrant companions who are imprisoned in Murcia and Valencia (Mediterranean area) and have expulsion orders on them. we denounce the events occurred last Tuesday the 29th on Capuchinos square, where the Internment Center is located, and where 2 young people were beaten up by the police, totally unjustified and afterwards they were hold up by the police During the detention, one the our mates was threaten by the police of being deported, he has an Italian passport. Today, 1st of February, our mate has been notified an expulsion in 8 days, even though he is a EU citizen A massive support campaign has been initiated, clearly it's a political manifestation of the events, as well as a repressive political answer done by the PP (right wing party) government, through the police, personified in Carlos Rubio- government subdelegate in Malaga. We ask all the political parties, unions, collectives, social movements, platforms, NGO's, mass media,... and people to show their support sending faxes denouncing the criminalization and to close the open expedient of expulsion of our mate sssssss Eduardo Sguiglia. Also you can participated in the "cacerolazo" (demonstration beating pans to make sound) tomorrow Saturday 2nd of February in front of Government subdelegate office at 18h.